Home Other Articles Eritrea: Where Is Eritrea and What Is It Known For? Eritrea. Surrounding territory greyed out. Colored according to vegetation. Eritrea, on the Red Sea coast of northeast Africa, consists of a high plateau in the north with a coastal plain which widens to the south. The capital is Asmara. It is bordered by Sudan in the west, Ethiopia in the south, and Djibouti in the southeast. The east and northeast of the country have an extensive coastline on the Red Sea, directly across from Saudi Arabia and Yemen. 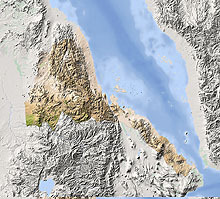 The Dahlak Archipelago and several of the Hanish Islands are part of Eritrea. Its size is just under 118,000 km2 (45,560 sq mi) with an estimated population of 5 million. Eritrea, officially the State of Eritrea, is an authoritarian state, run by the People's Front for Democracy and Justice (PFDJ). Other political groups are not allowed to organize, although the non-implemented Constitution of 1997 provides for the existence of multi-party politics. The National Assembly has 150 seats, of which 75 are occupied by the PFDJ. National elections have been periodically scheduled and cancelled; none have ever been held in the country. In its 2009 Press Freedom Index, Reporters Without Borders classified the media environment in Eritrea at 175 out of 175, the lowest possible rating, and below that of totalitarian North Korea at 174. The public media in Eritrea does nothing but relay the repressive regime's ultra-nationalist ideology and government propaganda; freedom of speech, and of the press, is virtually non-existent. Not a single foreign correspondent now lives in Asmara. Eritrea’s coast is hot; inland is cooler. Rainfall is unreliable. The agriculture-based economy has suffered from over thirty years of war and occasional poor rains. Eritrea is one of the least developed countries in the world.